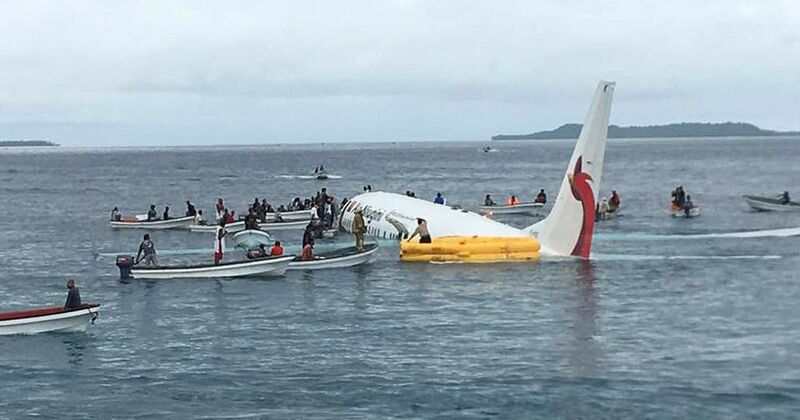 WELLINGTON, New Zealand (AP) — The airline operating a flight that crashed into a Pacific lagoon on Friday in Micronesia now says one man is missing, after earlier saying all 47 passengers and crew had safely evacuated the sinking plane. The airline did not immediately respond to requests for more details about the passenger, such as his age or nationality. Local boats helped rescue the other passengers and crew after the plane hit the water while trying to land at the Chuuk Island airport. Officials said on Friday that seven people had been taken to a hospital. The airline said six passengers remained at the hospital Saturday, and all of them were in stable condition. What caused the crash and the exact sequence of events remains unclear. The airline and the U.S. Navy both said the plane landed in the lagoon short of the runway. Some witnesses thought the plane overshot the runway. Passenger Bill Jaynes said the plane came in very low. Jaynes said he and others managed to wade through waist-deep water to the emergency exits on the sinking plane. He said the flight attendants were panicking and yelling, and that he suffered a minor head injury. “I was really impressed with the locals who immediately started coming out in boats,” Jaynes said in an interview with a missionary in Chuuk, Matthew Colson, that was posted online and shared with the AP. The U.S. Navy said sailors working nearby on improving a wharf also helped in the rescue by using an inflatable boat to shuttle people ashore before the plane sank in about 30 meters (100 feet) of water. Air Niugini is the national airline of Papua New Guinea and has operated since 1973. Data from the Aviation Safety Network indicates 111 people have died in crashes of PNG-registered airlines in the past two decades but none involved Air Niugini.